Sustainability frameworks are important for organizations aiming at disclosing their contribution to sustainable development and enhancing credibility with stakeholders. Sustainability frameworks aid companies in selecting and implementing sustainability programs by developing and applying a sustainability strategy to achieve, among others, competitive advantage and leverage efficient business operations. 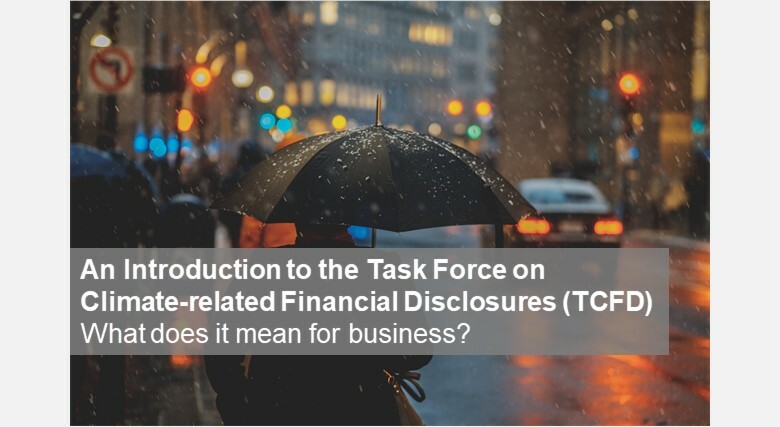 In the wide array of established industry-led initiatives, the Task Force on Climate-related Financial Disclosures (TCFD) disclosure framework, is focused solely on the financial disclosure related to climate change risks. Why is there a need for the TCFD? There is global awareness of the tremendous consequence of climate change it has on the world and global economy. Climate change may cause serious damage to organizations’ financial performance unless they do take precautionary and preventive measures to avoid both long-term and short-term climate change related risks. Apart from physical risk, changes in policy, risks brought about by globally agreed transition to a lower-carbon economy that is based on the use of clean and energy-efficient technologies, can lead to exposure to unforeseen risks. But are organizations prepared to manage challenges associated with measuring and disclosing information on climate change related risks? And if so, how such disclosure will enable identifying solutions faster? An answer to this question is what investors, lenders and insurers are looking for. Financial dislocations and sudden losses in asset values could be possible consequences of disruptive changes brought by climate change. Responding to these concerns, in 2015, the G20 Finance Ministers and Central Bank Governors asked the Financial Stability Board (FSB) to review how the financial sector can take account of climate-related issues. The FSB response was the development of the Task Force on Climate-related Financial Disclosures (TCFD), a voluntary and consistent framework that should aid investors, lenders, insurers and underwriters in assessing and pricing climate-related risks and opportunities. In the 2018 Status Report and the 2017 “Recommendations of the Task Force on Climate-related Financial Disclosures” Report, the Task Force laid out key recommendations around four thematic areas: governance, strategy, risk management, and metrics and targets. Given the fact that this new framework is in its initial stage of adoption, its adoption is not without its challenges and drawbacks. Apart from the financial sector, according to the Report, the Energy, Transportation, Materials and Buildings, and Agriculture, Food, and Forest Products sectors, can rip tangible benefits from this framework. There is no doubt, that in times of great uncertainty, organisations may need to make decision leading to heavy losses and financial instability. Including climate-related financial disclosures as part of financial reporting can support issuers and users to make well-informed decisions and “ultimately, support more appropriate pricing of risks and allocation of capital in the global economy”.